Home Costs > How Much Does an Ejector Pump Cost? How Much Does an Ejector Pump Cost? The ejector pump is a mechanical device that pumps the water through the pipes when gravity is not enough, and this piece of equipment is usually placed in basements where the main pipelines are below the main sewer or septic lines. If you are planning to have a laundry room or bathroom in your basement, it is likely that you will need to have an ejector pump installed. The cost of an ejector pump will depend on the brand, the type, power output and where it’s purchased. On average, plan on spending anywhere from $750 to as much as $1,900 for an ejector pump for a professional install for a simple swap and replace. Now, if the contractor needs to cut out a slab for the pump, install new drain lines and needs to re-concrete the area, the costs could be in the $2,500 to $4,500 range. Since all jobs will be unique, consider getting multiple quotes from licensed contractors for free at HomeAdvisor.com. Without the professional installation, parts can be in the $200 to $600 range. A 3000 GPH model, for example, which is able to pump 3,000 gallons of water per hour could be in the $250 range, whereas a 7200 GPH model could be closer to the $800 range. For example, a few contractors were discussing what they should charge to install a brand new sewage injector pump. According to most answers, many agreed the prices should be in the $800 to $1,500 range. On TerryLove.com, a forum member stated they were quoted $800 to replace a failing ejector pump. 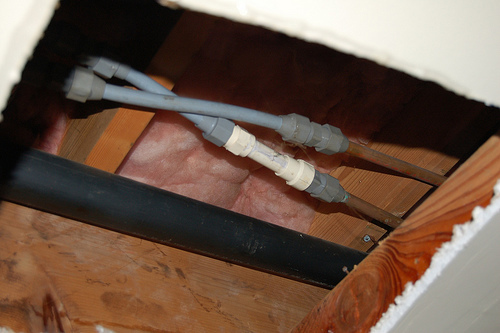 In most basements, the plumbing will run through the ceiling, running in between the joints and eventually connecting with other pipes to circulate the water and eject the waste. In the basement, however, all plumbing will be installed beneath the ceiling, which means it will need a “boost” similar to the plumbing functioning in the upstairs. This ejector pump will have a single pump and float inside, often equipped with a sensor that sounds an alarm if the pump were to fail. These pumps will have a storage tank which will hold a certain amount of sewage. As the float rises with the sewage, it will signal the pump to cycle on, essentially moving the sewage out of the tank and into the home’s main plumbing lines, where it will eventually flow into the main sewer line. When the tank empties, the float moves toward the bottom, shutting the pump off in the process. During an install, if an ejector pump is already present, the contractor will pull out the older pump, vacuum the pit and install the new ejector pump, along with a new lid and ball. These inclusions can vary from one contractor to another, so be sure to ask for an itemized bill before placing a down deposit. If no ejector pump is present, then the job could become much more complex because the contractor will have to cut out a new slab, install new plumbing lines and re-concrete the area he or she was working with. This job could take up to 10 hours. Manufacturers usually include a warranty for the products that they sell, usually between three to five years. If the sewage tank is dirtier than average, some contractors may add a surcharge. While optional, some homeowners opt to install a backup pump for protective measures. An ejector pump should be maintained monthly to keep it in good condition. During a professional maintenance call, the professional will clean the pump, oil the motor, remove any debris inside the tank and inspect the pump to make sure it’s in working order. Those who own an ejector pump should carefully watch what they flush down the toilet. Items such as feminine products and disposable wipes can put stress on the pump, oftentimes, preventing the pump from pushing the water to where it needs to go due to the clogs these items cause. If your ejector pump isn’t working right now, Family Handyman recommends checking the switch before thinking about replacing it. If the switch were bad, it could be replaced for under $20 on average. I’ve been quote $3k to replace my 2000 series 26 yr old sewer ejector pump ,cant understand why so expensive to others?